Poppy goes POP in my mouth! I'm way behind on posting about Poppy Seattle, but WOW what a great place for some amusingly interesting and delicious food! I went with four friends and pretty much everything we had from the drinks, to the appetizers, main course and through to dessert, was so yummy! Playing upon the idea of the Indian "thali" meal with a variety of dishes all on one compartmentalized plate, each item was so unique and incredibly tasty. I took a couple of photos of the menu, so you can see how the menu varies. 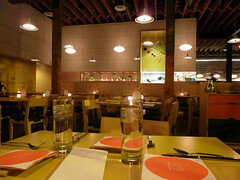 A month ago when we went, we had a slightly different menu as it changes with the seasons which is always really nice. My quail thali was nicely seared and flavorful and I loved trying all the little bundles of food, especially the pickled pear and fennel which wasn't even the main item! But all the accompanying side dishes were just divine. 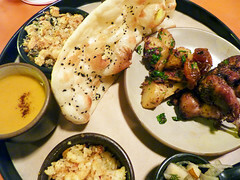 The food although Indian influenced with spices such as cardamom, cumin, and pickled salads seemed to also be fused with some other styles of cooking as well. The dessert was a melange of sweets with an array of flavor combinations...I'm a dessert FIEND, so they were all good to me. I'm sorry in this review I'm not really singling out my favorites, because I really loved it all! The only downside was that our main dishes took an extra long time to come out because there was a huge party there that they seemed to serve first, despite us coming and ordering before them. 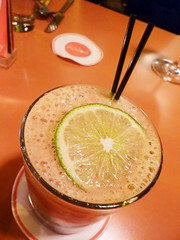 I was slightly miffed, but my miffyness was quickly forgotten upon my first bite and sip of my tantalizing Artifizz (seen in the last photo). This is a great place to try something different either for dinner or happy hour, their drinks are phenomenal (more Artisan varieties), and although the prices are on the high side, it's totally worth it for a special night out! This will probably the most deep fried, bad for you, artery clogging item you will ever see on my blog, but I had to post it because I can't believe I ate it. These ooey gooey crispy evil deep fried cheese curds at The 5 Point Cafe in Seattle were just something I had to try. TASTE BUDS PREPARE TO LAUNCH INTO COSMOS UNKNOWN. Biting down on these, you get the crunch of the batter and then the hot cheesy saltiness of the cheese curd dancing in your mouth. Served with some kind of garlic aoli, I had a few with the sauce but honestly they were perfect on their own. My original plan of just "tasting" it quickly fell short and I found myself eating more than my hubby! Towards the last few pieces we slowed down to a heavy-breathing crawl, but we got a decent dose of these insane crispy mouth treats. 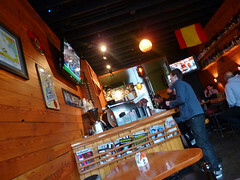 The regulars and staff are a mix between friendly and "frank", and my husband makes weekly visits there for after or for lunch. Toss in a few dollars at the jukebox and you're good to go! I must say, my visit there years ago was a much different experience, more "raw" if you will, but the place still has a good dose of grunge and the periscopes in the bathrooms looking upon the Space Needle are an old fixture. I guess a month or so ago they closed the place down for a bit to do a deep clean and you can definitely tell. 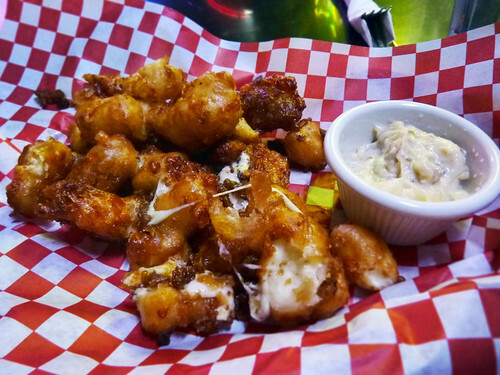 If you are ever in Seattle and want to experience one of the most famous dive bars in town whose food is pretty damn good, you should totally hit up this place and for the love of god, don't pass up the deep fried cheese curds. This is something ANYONE can do that's always a hit. 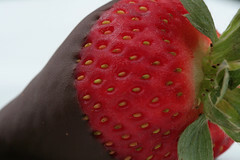 Just make your favorite ganache or simply melt some chocolate and cream/milk in a double boiler, wash and DRY some strawberries and start dipping! I made some for work today, and added an extra little flair by lightly sprinkling them with Fleur de Sel (hand-harvested sea salt). ENJOY! And if you have chocolate left, throw it into some Tupperware to save for whenever you need a chocolate fix. A quick nuke in the microwave and you have instant bliss for your tastebuds. This is a slightly modified version of a recipe you can find on All Recipes. I don't put as much olive oil or garlic because I feel like it's too oily and overwhelmed with garlic. I just love the basic freshness of all the other ingredients and it's a quick and easy recipe for parties or just to munch on yourself! Serve with toasted bread or pita chips! *Note: The photo is of the ingredients before everything is pulsed in the food processor. 1. 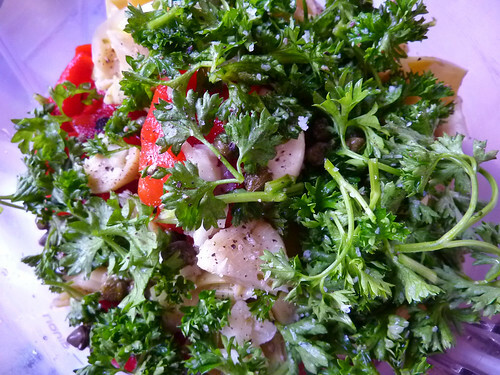 In the bowl of a food processor, combine the red peppers, artichoke hearts, cilantro, Parmesan cheese, olive oil, capers, garlic, and lemon juice. Pulse until finely chopped and the mixture is blended. Transfer to a serving bowl and season to taste with salt and pepper. Cover and refrigerate for at least 2 hours before serving to blend the flavors. Within walking distance of my house. PERFECT. 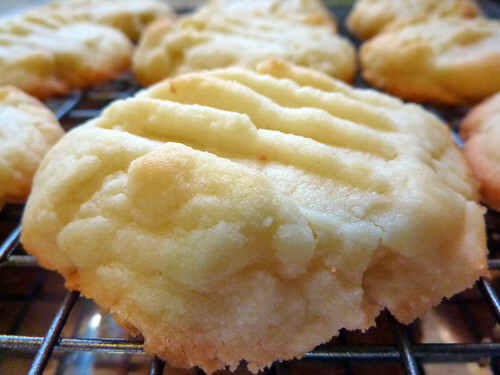 Easiest Most Sinful Shortbread Recipe Ever! Whip butter in a medium bowl with an electric beater. Combine flour, sugar, and cornstarch in a large bowl. Gradually add the butter and mix well. Dough may be crumbly, but don't worry here's why: Make little 1" balls with your hands (pressing them together, not rolling them in the palms), and put them on a non-stick pan or greased sheet. Flatten balls with a fork. Bake 10-12 minutes until lightly brown on the bottom. My oven runs hot, so it only took 10 minutes for mine to be done. And for extra sinful pleasure, melt some chocolate and drizzle on top or dip them halfway with it! Or for a more savory twist, add about a tablespoon or so of finely minced rosemary!